Glowering clouds threaten rain – this scene looks like one I’d see here in the Pacific Northwest, but I have a feeling this was taken elsewhere. The gloomy clouds made the village seem more cantankerous than usual. Mary trudged along the path toward market, Anna at her side, skipping along, humming. ‘What’s that song, Anna? It’s a lovely tune.’ Listening, Mary’s mood lightened. ‘It’s the birds, gramma. See?’ Anna pointed to the birds on the wires above. ‘No, silly – they are the music!’ Anna laughed, tripping further ahead. Mary marveled. They did look like notes on a musical staff. Shaking her head, she was smiling as they reached the center of town, feeling as if the sun had suddenly come out. This entry was posted in Flash Friday Fiction and tagged family, Flash Fiction, writing. Bookmark the permalink. There are a handful of musician in my life that I’m sure have done exactly this. Nice story. I love it! 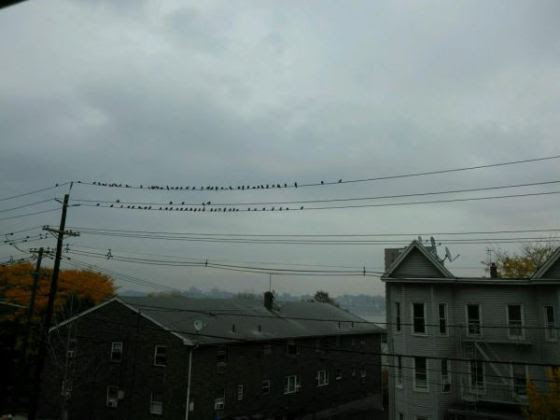 Birds looking like notes on a musical scale is very clever! This definitely put a smile on my face. I feel like this is one of your best ones yet but I’m pretty sure I think that most weeks. I guess you keep getting better and better at writing! I love this. There’s nothing like music anywhere you hear it in nature. My mom taught me to listen to those sounds. She also was a music teacher. Sweet story. I could hear the music. I love the cantankerous village and the birds as notes. Clever grandchild, lovely story. I really thought they looked like as the notes for a melody too… Your song was much sweeter – much needed with a cantankerous town. Grandchildren do that. Happy Mother’s Day Erin.